It’s back!!! Ringling Brothers, as we mentioned a few days ago will be at both the Verizon Center and the Patriot Center!! We loved the show last year, and we’re excited to see it again!! We’d like to invite a PwcMoms reader and their family to join us, too!! Leave a comment on this post telling us your favorite circus memory and you could win a family four pack of tickets to opening night at the Verizon Center!! YOU MUST BE ABLE TO ATTEND THE OPENING NIGHT PERFORMANCE March 15th at the Verizon Center. I realize it’s late and a school night, but it’s totally worth it, and the morning announcements aren’t going to be that exciting the next day, anyway. I looked. This contest ends on March 3, 2012 at 5pm. 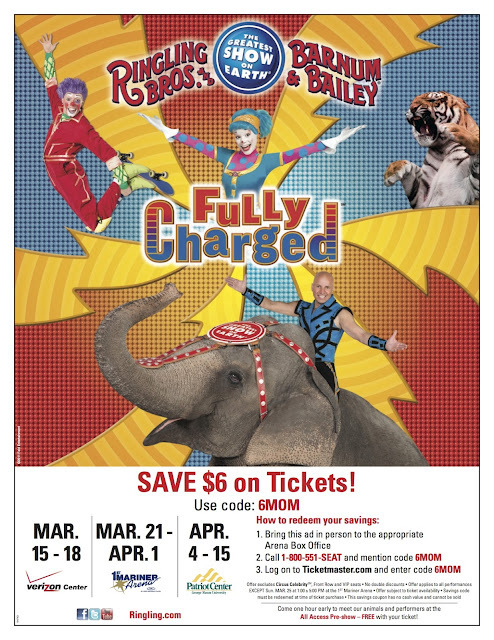 Disclosure: PwcMoms thanks Ringling Brothers and their associates for providing giveaway tickets and tickets for PwcMoms. PwcMoms does not endorse your children missing or being late to school. We do encourage you to go to the circus, however, because it’s fully awesome. Any liability is assumed by the winner, PwcMoms is not responsible for postponed or cancelled shows, or for the winner being unable to attend the scheduled performance. All opinions expressed are the truthful opinions of PwcMoms. Your opinions or experience may vary, which we are not responsible for, but would like to hear about.